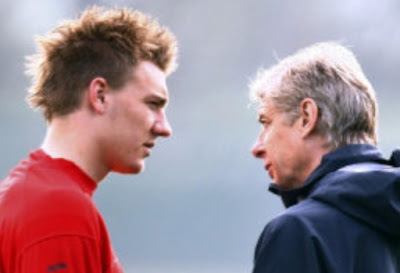 The comments published yesterday on the blog by Nicklas Bendtner have been responded to by Arsene Wenger when he spoke with the written journalists at his weekly media conference yesterday. "I communicate every day with him and he never told me that. I don't know. Have you ever seen a player who is on the bench and not frustrated? "He works hard, he has been out for a long time. I must say I have been very pleased with his attitude and spirit. He has to continue to work and when he is completely match fit he will play. "I must say his attitude has been extremely committed and I can understand [his frustration] because he has put a lot of effort in. Now he has to be a little bit patient." The manager as always speaks perfect sense. What player would be happy with sitting on the bench? We saw him sidelined most of last season through injury, which meant his appearances were restricted to just 31 games compared to the 2008-09 season where he made 50. It obvious what he needs to do. Exactly what he did to force his way into the team when we had Emmanuel Adebayor in the side, who you would describe as a similar style of player. He worked hard in training and the manager picked him. When I read the comment from Bendtner yesterday I had a feeling on duja vu. Regular readers might remember me posting this on October 26. "From what I've heard Bendtner is not concerned by the arrival of Marouane Chamakh. He speaks highly of him in the interview with the Daily Mirror, but from the whispers I've been hearing does not think the Moroccan is not a threat to his place in the first team. "Now we all know he's arrogant and certainly thinks highly of himself. But to dismiss Chamakh's impact on the team and to think once fit he'll walk back into the team is another thing. "Baring injury to the Moroccan, I fear Bendtner will spend quite some time on the substitutes bench this season." It appears now that Bendtner is concerned. But he's an exceptional talent who will get his chance. He has to be patient. An aside here: I've been surprised at the reaction to the comments made by Bendtner on internet forums, this blog and others. It seems people are genuinely split into two camps. Those who like him and those who don't. For a footballer who is 22-years-old, he is someone I would rather have than not. He is liked by his team mates and is an asset to our squad. I imagine its is perceived arrogance which people don't like. He's cocky and in a confidence sport like football, I'm glad he's that way than not. He's certainly not the big I am in the way Adebayor was/is. The other interesting thing to emerge from the manager's press conference was his reaction and answers to questions about Manuel Almunia. If you've got a subscription, go and watch it on Arsenal TV Online. The manager usually gives long and flowing answer to the questions put to him by reporters. However on the subject of Almunia, the Frenchman was unusually tight lipped. "Of course Almunia has a future at the club. He has been out for a long time, but he must come back and shows the performances in training and his quality. "You can never stop a player from playing." "At the moment what we are focused on is to win together with the squad we chose at the start of the season. "We are on a train which wants to go to the terminal station - and that means nobody moves out when the train is moving." It was interesting that he said Almunia has been training but not with the squad. However he added that he could join up with the team again on Monday (when many players will be away with their countries). At this point in time I cannot see a way back for Almunia. I personally don't think we'll see him in an Arsenal shirt again. With Fabianski's form and Szczesny signing a new deal, I cannot see the boss picking him, unless in exceptional circumstances. To me it seems he's lost patience with the Spaniard and that will mean a continued absence from the first team squad on match days. There are two good extended interviews in the papers today. Cesc Fabregas talks to Chelsea supporting Rob Beasley in The Sun. Whilst team mate Theo Walcott talks with John Cross in the Daily Mirror. Finally, something I posted on Twitter yesterday, there is a nice video of Cesc and Theo chatting on the BBC site which will be featured on Football Focus later. The only other thing to mention is the early team news. The manager didn't add to the information we didn't already knew, which is that Kieran Gibbs will return to the squad following his injury.